Schools still rely heavily on using spreadsheet programs such as Excel to create data charts. Excel is an awesome program, but there are web 2.0 tools out there that skip all of the "stuff" that you don't need. These web 2.0 tools let you set up your data in a matter of seconds and then will allow you to create all sorts of data charts using that information. Today I would like to highlight an awesome web 2.0, cloud computing tool that allows the user to create awesome data charts. This tool is Chartle.net. What does Chartle allow you to do? 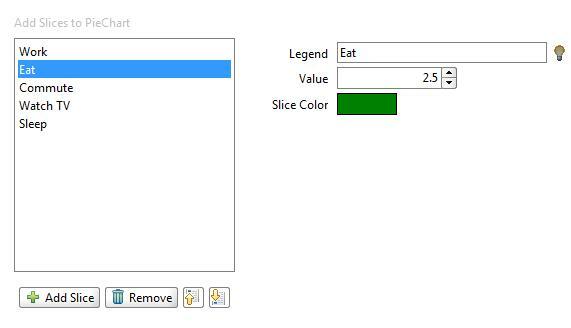 Create dynamic sets of charts based upon numeric variables. Bar, Pie, Line, Plots and Diagrams, Business, Dynamic, Ven Diagrams, Concept maps, charts from US and World maps. Embed and share your map by email or on your blog and website. 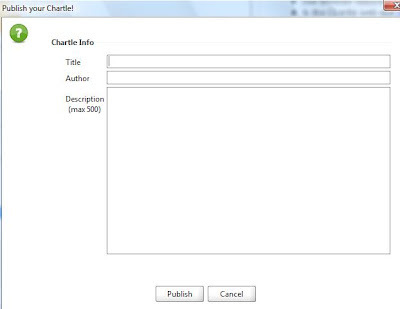 What are the advantages of using this Chartle.net? So far it is completely free. It says that it is in Beta stage so eventually they might charge or have a free version, but right now there aren't any strings attached. You don't have to register to use this site. Just start adding your data and create your dynamic chart. Extremely Easy to use that I believe even an elementary student can use it without too much guidance. 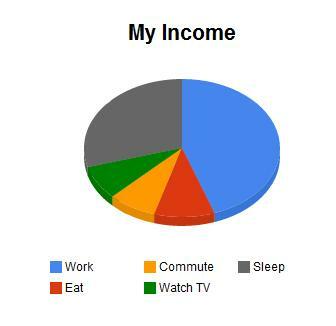 Below is a sample of a chart that I created in just over a minute. 2. Click the "Create" link. 3. Now choose which type of chart you would like to make. There are quite a few. 4. In this tutorial I chose the "Pie" chart. 5. After you choose the chart type tab, click on the more specific type of chart. 6. Give your chart a title and change the color and size of the text you would like to use. 7. Decide how big you want the chart to be, by changing the width and height. 8. Choose where you would like your legend to appear in relation to your data and chart. 9. 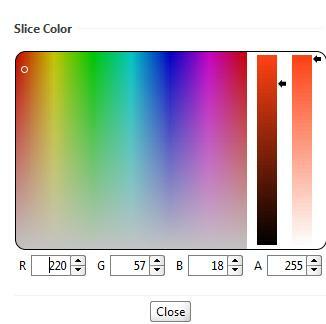 Decide whether you want the chart to be in 3D or not, by selecting the check box. 10. Now notice that as you play with these variables you will see the chart change to reflect your choices. 11. Now click the Data tab, once you have set your chart up. 12. From this screen you can Add parts to your chart, remove unwanted chart parts, enter you data under each section of your chart, change the chart colors. Again, to your right you will see your chart change as you change the variables. 13. To change the color, just click on the color bar and you will get this box. From here you can change and choose your colors. 14. Once you are all done with your chart, click the "Publish, Share or Embed" button. 15. Here is where you will claim your chart, by giving it a title, your name, and the charts description. Push the "Publish" button when you are done. 16. From the next window, you can share your chart on places like email, twitter, and facebook. 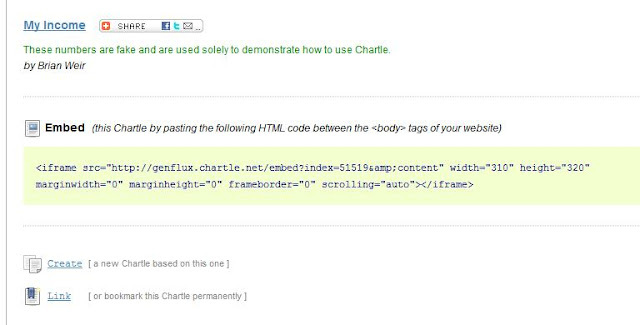 You can copy the embed code like I did and embed it into your website or blog. You can also generate a permanent link to this chart. Well that is all there is to create a very easy and dynamic chart full of data that your students collect during their science, math and other classes that require chart making. 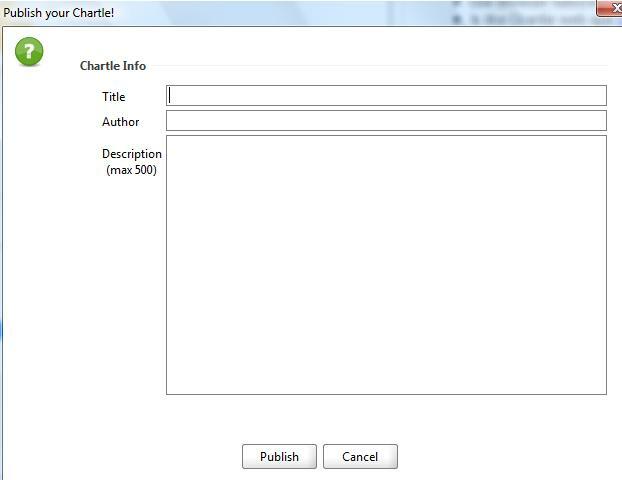 If Chartle.net isn't quite what you are looking for give some of these other chart making tools a try.